The 2010 WBRU Rock Hunt Finalists, Keep Me Conscious, return to Providence one last time and with a brand new record too. That’s right they are pulling the great rock ‘n roll swindle. Releasing a record and then calling it a day. On a high note it will be with 2 great shows lined up to celebrate the release the new record, Merci. Produced by Mike Poorman (TREOS, Therefore I Am, The Dear Hunter) at Strangeways Recording and co-engineered by Daryl Rabidoux (The Cancer Conspiracy, Deleted Arrows), the band’s second EP is their best yet. You can hear the first track, Escape Route above. So why break up with such great achievements? You can read all about that on their blog here. But we’re not as concerned with the end as we are with the now. Their first release show will be this Friday, August 19 at Firehouse 13 in Providence. 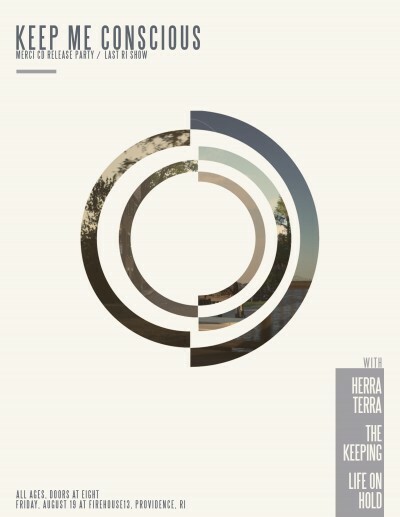 Their friends in Herra Terra, The Keeping and Life On Hold will also be playing. If you’re not in RI for this, then make sure you are at the Middle East in Cambridge for their final show downstairs on Saturday, August 27 along with their friends in Roman Traffic, Prospect Hill, Herra Terra and DJ Joey Green. Both shows are just $10 and you’ll be able to grab the record that night probably for cheap. You can also gaurantee that the Gansett’s will be flowing both nights because they drink a lot of them. You can hear more on 95.5 WBRU’s Home BRU’d tonight at 9pm and check out the video below.